60655 Modern Style Vintage Turkish Kilim Flat-Weave Rug, Striped Kilim Area Rug. This handwoven wool vintage Turkish Kilim Jajim Kilim rug features a variety of colorful stripes composed of both wide and narrow bands forming a captivating visual effect. Vintage, but modern and displaying a universal appeal, stripes are a Classic pattern. Highlighting the finest trends in modern Bohemian interiors and eclectic spaces, flat-weave Kilim rugs enhance nearly any living space with a striking palette of nature. The modern style and functional versatility combined with its colorful stripes make this vintage Jajim Kilim rug well-suited for a range of styles from Bohemian lofts to rustic cabin homes and mountain lodges. Drawing inspiration from Paul Klee's Highway and Byways in 1929, this striped kilim will seamlessly fit into modern homes, contemporary spaces, and Bauhaus interiors. Rendered in a kaleidoscope of colors. 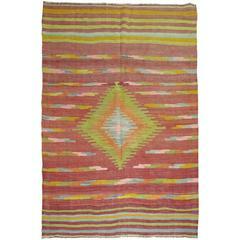 This vintage flat-weave Kilim rug is backed with a cotton fabric as reinforcement. Flat-weave Kilim rug. Striped flat-weave rug. Abrash and some age wear. Handwoven wool. Made in Turkey. Measures: 11'11 x 15'00. A colorful Turkish Kilim flat-weave rug. Large-scale lime green medallion with accents in orange, pink, gray on a burnt red field with a striped motif on both ends. A psychedelic Midcentury Turkish Kilim. 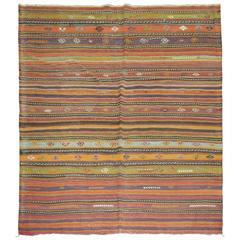 One of a kind Turkish Kilim featuring a bright orange color. Striped motif Turkish Kilim with multi-vibrant colors. 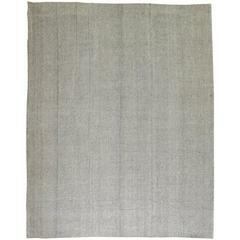 Plain solid gray one of a kind Turkish Kilim with small specs in black.